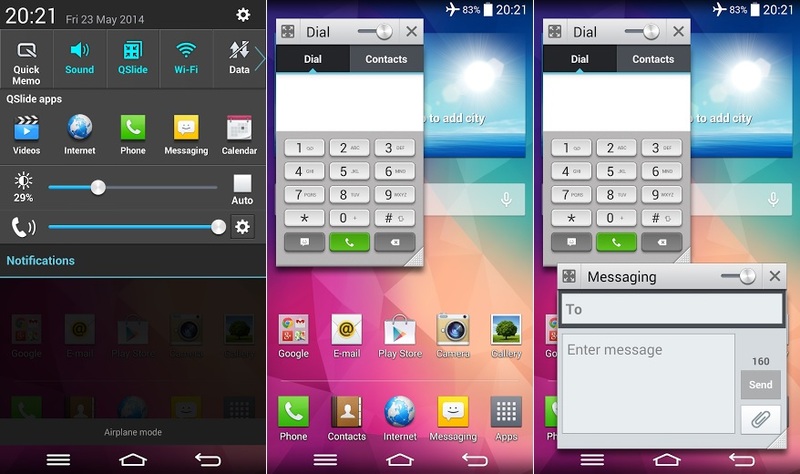 QSlide is a feature in the LG G Pro 2 which again helps in Multitasking, just like the Multi Window feature does, but the functioning is totally different and the QSlide offers the users with a smaller window for the selected app, and this window can be easily dragged, resized and the transparency of the window can be changed so that you can try to check what’s underneath it. To find the QSlide feature, you have to just drag down the notification panel from the top, and check for the list of apps under the “QSlide apps” section, and if that isn’t shown there, you will need to toggle the third option “QSlide” from the quick settings in the panel. The apps listed under this are quite a lot – Videos, Internet, Phone, Messaging, Calendar, E-mail, Memo, Voice Mate, File Manager, Calculator. You cannot add any other apps in this list, but the position of these can be changed. To use QSlide, tap on any app under the QSlide apps section and you will notice a small version of it opening. This is just the mini version of the original app, and it doesn’t alter any function of the actual application. 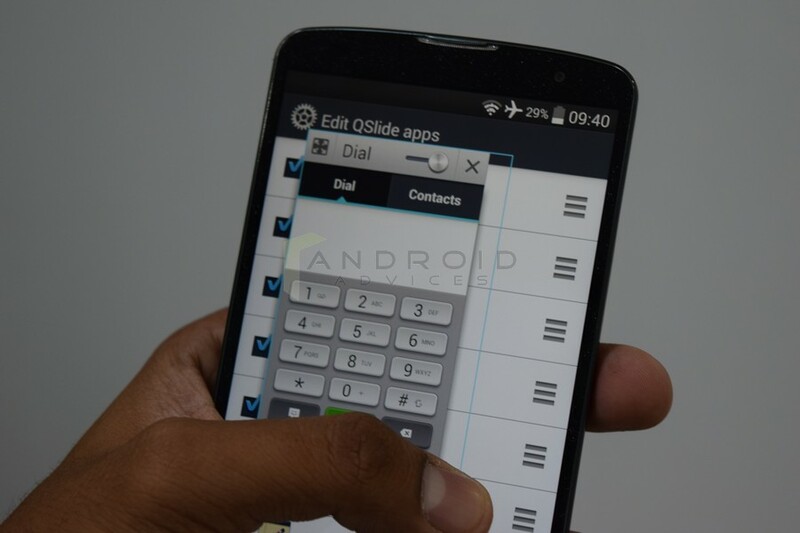 For example, opening the Phone app from QSlide would give all the options for dialing, calling, searching for contacts, just like it was possible on the original app. Change the size – The size of the app window can be changed, by just holding the right bottom corner of it and dragging it to the side. Change the transparency – The transparency of the QSlide app can be altered, where you would be able to check the content beneath this app window, if at all there’s a need for it. It comes handy where you are trying to write down something in the Memo app, and have a picture opened in the background in your browser. 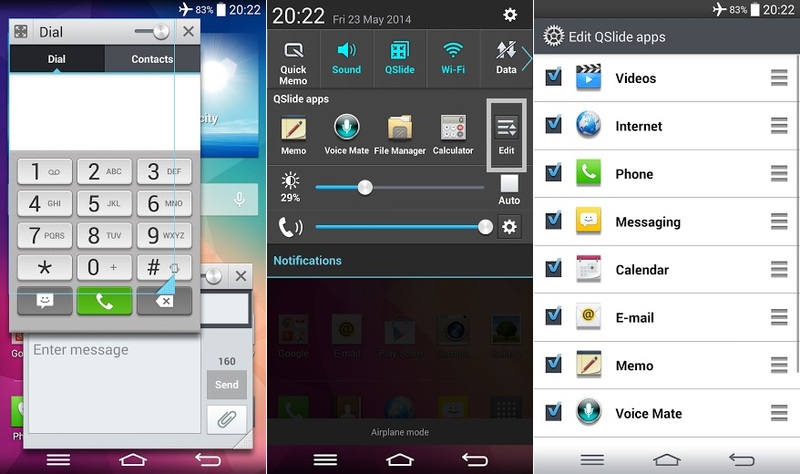 The first apps shown in the QSlide section are Videos, Internet, Phone, Messaging and the others follow them and you need to drag it to the left to check the entire list. If you wanted to have some other apps in the front, go to the end of the QSlide list by dragging to the left, and you will notice an option “Edit” which on tapping would open the entire list and you can change the positions from here. You can even choose to remove any apps from showing in the QSlide. I HATE this so called multi-tasking app, mine doesn’t even have the Internet option, it has everything else you mentioned but the Internet. And yes I double checked to see if it was unchecked in the edit option but it’s still not there… ughh, it’s really dumb they didn’t make it so you can pick and choose your own apps you want to use for multitasking..